For Streamlight flashlights, this wand converts your flashlight into a highly visible traffic wand which can be used in all weather conditions. Works great on my scorpion. Excellent product. Had to use it within hours of receiving it and worked perfectly. I definitely have the attention of traffic when used. It's a little too long for my taste, takes up a lot of space in the duty bag. But it's a perfect snug fit on the flashlight. 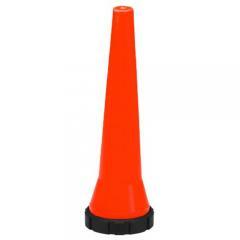 Very bright red, prefect for Traffic Control. Fits great. Nice add for Streamlight flashlight. Will this fit a stinger flashlight? Will it fit a strion flashlight? Yes - just make sure to select the appropriate light from the drop down menu.